RUSH: Here’s Trump, by the way, taking a swipe at Hillary Clinton over NATO. THE PRESIDENT: NATO has taken in billions of dollars more because of me, because I said, “You’re delinquent, you’re not paying,” to many of the countries. Is that right, many of the countries weren’t paying. And even now Germany is paying 1% and they’re not even paying the full 1%. The United States is paying close to 4%, the United States, as you said, is paying 80% of the cost of NATO, do you think that’s fair? 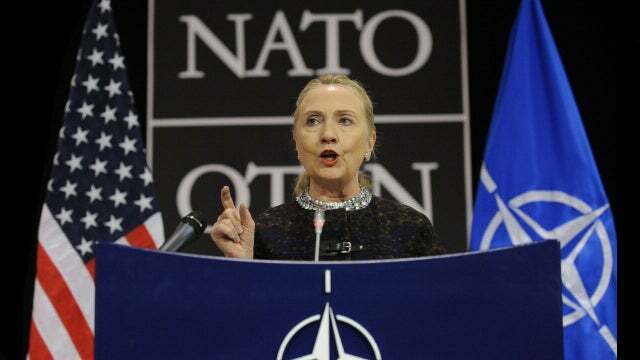 With all of that being said, because of me, and you can speak to the head of NATO, Mr. Stoltenberg, he said that because of what I’ve said to the countries, they’ve taken in, General, I think you’ll confirm this too, many billions of dollars more than they would have had if you had Crooked Hillary Clinton as president, okay? That I can tell you. So here he is, he is sitting there with the leaders of Estonia, Latvia, and Lithuania talking about NATO and how most member nations are paying nowhere near their fair share of the dues and talking about how much less money these nations would have if Crooked Hillary had been elected, not Hillary Clinton, but Crooked Hillary. And this is the kind of stuff that the establishment, you can see them flinch. This just isn’t done. You’re not supposed to talk about presidential candidates and senators and first ladies, crooked, ew. We just don’t talk that way, so unsophisticated, it’s so coarse. And it just isn’t done. And of course Trump does it. And by now it’s obvious Trump does it on purpose. Just gets a big thrill out of tweaking. RUSH: All right. This press conference is with the three leaders of Latvia, Estonia, and Lithuania. So it’s not a Trump standalone press conference. He’s got these other three guys up there with him, and their media is there. So the Latvian, Estonian, Lithuanian media is gonna take their time asking questions of their leaders. So we’re gonna roll audio on this. We’re not gonna JIP this. I know when the domestic media gets their chance they’ll zero in on the caravan and probably Stormy Daniels, who knows whatever else. I don’t want to have to sit here and cover 20 minutes of this for three or four minutes of it that might be of any value. So we’ll roll audio and any highlights we’ll be sure and share ’em with you.